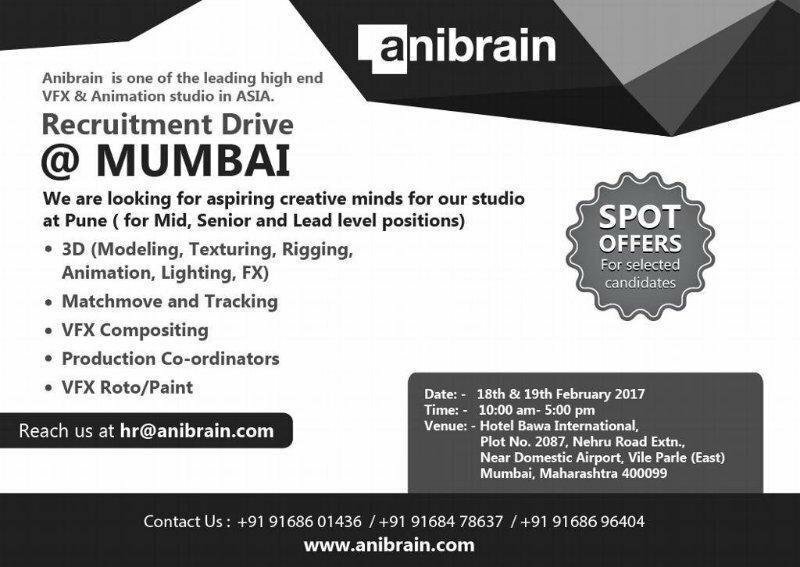 Anibrain Recruitment Drive is scheduled at Mumbai with on spot job offer. Various job requirements of 3D Animation and VFX are open to apply for. Pune based Anibrain Studio is one of the leading Post Production Studios of Indian Animation and VFX industry. The visual effects studio is internationally acclaimed for their stunning output in ‘Roar’ movie. The recruitment drive schedule is as follows. Venue: Hotel Bawa International, Plot No. 2087, Nehru Road Extension, Near Domestic Airport, Vile Parle (East), Mumbai, Maharashtra – 400099. Send your latest resume and demo reel link to hr@anibrain.com. For any queries, call up on +91 91686 01436 / +91 91684 78637 / +91 91686 96404.